The Open Structured Rhinoplasty Workshop is held on the last Saturday of February at St. Vincent’s Hospital. This course runs during the third week of February. Please contact Margi Griffiths for an application form or this year’s course details. 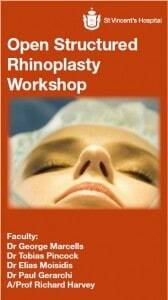 The course is aimed at practising surgeons and registrars. Both Plastic and ENT surgeons are welcome. Sessions are both lectures and dissection, with the morning devoted to approach and the afternoon to refinement. This course is CME accredited. Download the 2011 registration brochure for detailed information about the workshop. Copyright © 2018 Prof Richard Harvey and Sydney Ear Nose & Throat Clinic.